Censusers: Jean Demers, Lisa Keelty, Betsy McFarlane, Clémence Soulard, Elise Titman, Rodger Titman. Notes: For the first time since 2008, there was no banding at MBO over the last three months of winter, as the weather (and to a large extent the depth of snow) limited access and activities. Some of the snow has even lingered into the start of the spring season, and not surprisingly, our total of 30 species observed over the course of the first week is the lowest since 2008. As usual, we will be conducting our one-hour census daily for the first three weeks of spring before launching into full operations with banding on April 18. The highlight of the week was our continuing Tufted Titmouse, first observed at the feeders on February 1. Otherwise the species observed this week were the typical residents (such as Downy Woodpecker, Black-capped Chickadee, Northern Cardinal, and American Goldfinch), supplemented by the usual early arrivals (e.g., Mallard, Song Sparrow, Red-winged Blackbird), and lingering winter birds (including American Tree Sparrow and Slate-colored Junco). As in six of the previous eight years, Canada Goose was the most abundant species during the first week of spring. However, the numbers were a fraction of what they usually are – mean daily counts in those six years ranged from 179 to 1099! Only in 2008, the last year with such a late spring, were Canada Goose numbers lower, with an average of just 3 observed per day. Similarly, Red-winged Blackbird has been the runner-up in week one for six of the previous years, but the previous counts ranged from 25 to 47 per day, and this year the daily mean was only 14. American Robin migration also appears to be later this spring, with far fewer observed than most other previous years at this time. 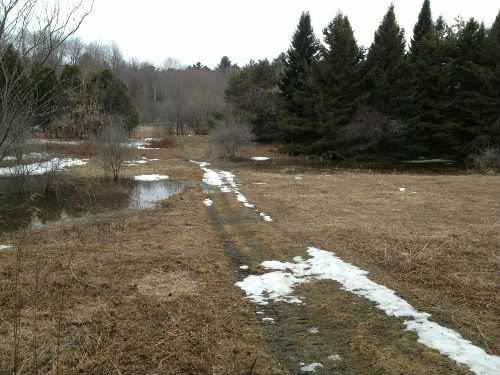 Even the local regulars such as American Crow and Black-capped Chickadee were relatively scarce this week – or at least were quieter than usual for late March / early April, and therefore not as easily detected by our census team. Notes: After an unusually quiet start to spring, diversity picked up a bit in week 2. However, the 37 species observed this week was still somewhat below average. New arrivals this week included some species that typically arrive in the first week, such as Wood Duck and Eastern Phoebe. Others noted for the first time over the course of this week were Common Merganser, Double-crested Cormorant, Sharp-shinned Hawk, Killdeer, American Woodcock, Brown Creeper, Winter Wren, Brown-headed Cowbird, and Purple Finch. 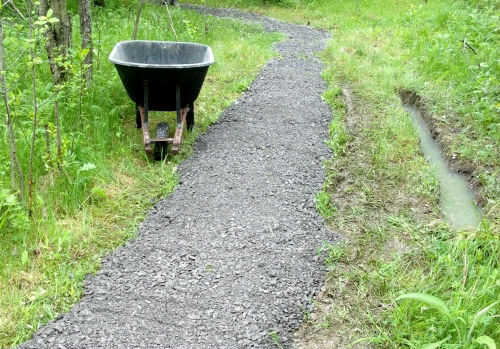 Big thanks to the volunteers who put in a great effort kicking off the 2014 site maintenance program! The top two species observed this week were unchanged from week one, and that was no surprise, as Canada Goose and Red-winged Blackbird have been #1 and #2 at this time of year for five of the previous seven spring seasons – the only exceptions being 2011 and 2013 when large flocks of Greater Snow Geese bumped the blackbirds out of the runner-up position. Although Canada Goose numbers remained unusually low compared to previous years, the Red-winged Blackbird counts were relatively typical for this point in the season. On the other hand, the influx of Cedar Waxwings this week was a surprise, as this species has only been in the top ten for week 2 in three of nine previous years, with a maximum daily count of 18 individuals, barely more than half of this year’s tally. From there, numbers dropped off substantially to Black-capped Chickadee in fourth place, with relatively typical early spring numbers. The rest of this week’s top ten includes modest numbers of many of the local regulars. Notes: Although we have had some more chilly weather, migration is continuing regardless, and our daily census efforts are starting to yield results that are more typical of years past. Among the 44 species observed this week were another dozen new arrivals for the season, featuring three of our common sparrow migrants (Swamp, White-throated, and Fox), several other early songbirds (Ruby-crowned Kinglet, Hermit Thrush, Brown Thrasher, Rusty Blackbird), a couple of other site regulars (Yellow-shafted Flicker and Tree Swallow), and some less frequent visitors (Green-winged Teal, American Kestrel, and Belted Kingfisher. The top three species this week lined up in the same way as last week, with the top two each increasing for a second week in a row. In fact, the mean daily count of Red-winged Blackbirds was the highest for this time of year since 2006, when we had only slightly more (57 per day). Similarly, the count of Canada Geese was well above average, given that in many years, the migrants are starting to taper off by this point. Cedar Waxwing numbers dropped slightly, but are still unusually high for this time of year, with higher counts recorded only in 2005. Perhaps similarly delayed by the late spring, American Robins moved through in good numbers, with a higher mean daily count for week 3 than ever before. Song Sparrows also increased this year, to a typical level of abundance for mid-April. Ring-billed Gull, Black-capped Chickadee, and Slate-colored Junco hung around the bottom half of the top ten, while Greater Snow Goose and Blue Jay were new additions, displacing American Crow and Northern Cardinal. 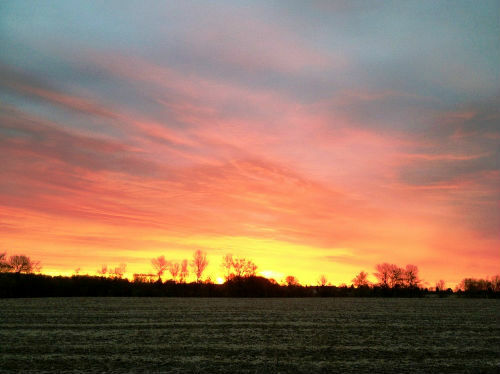 Notes: As always, we look forward to the arrival of week 4, which marks the start of our 45-day spring banding season. Usually migration is still quite modest at this point, with weekly totals over the past nine years ranging from 39 to 141 – so the new record of 169 this week was quite a pleasant surprise! The 31 returns this week is also a big jump over the previous week 4 record of 24 set just last year. To go along with that, the 69 species observed this week tied the previous record set in 2008 … perhaps not coincidentally the last time we had such a late spring. 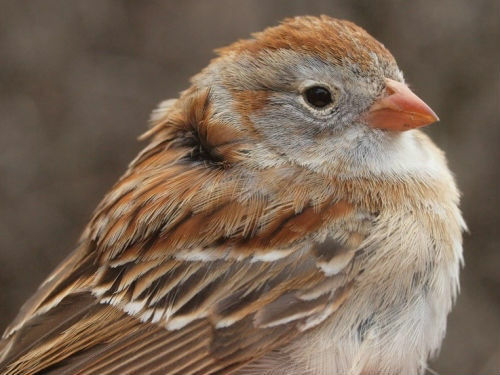 In a week of unusually abundant species, it was almost easy to overlook the significance of this bird – the first Field Sparrow banded at MBO since spring 2006, and only the fifth one overall. The high count of species this week included 19 new arrivals for the season – or at least new observations (the Great Horned Owl was no doubt here all along, just not previously detected). Among the other new species were half a dozen diurnal raptors – Turkey Vulture, Bald Eagle, Northern Harrier, Cooper’s Hawk, Broad-winged Hawk, and Merlin; the first four of those were observed as part of a good raptor migration on the first day of the week. Four species contributed strongly to this week’s new banding record. Leading the way was Cedar Waxwing, which has topped the banding list for week 4 twice before (in 2005 and 2010) albeit with lower counts, but in five other years didn’t even crack the top ten for this week! Ruby-crowned Kinglet is almost always among the top five species to kick off the banding season, but only once before did it occur in higher numbers at this time of year (a whopping 56 of them banded in week 4 of 2008 … yet another parallel between the 2008 and 2014 spring seasons). The number of Fox Sparrows this week was particularly impressive, as the spring total for the species ranged from 0 to 23 from 2005 through 2012, and only last year finally surpassed that level with 42 banded, including 32 in this week. Rounding out the impressive top four was American Robin, with this week’s 21 individuals a big jump over the previous high of 13 for week 4, and notable as the species hasn’t even cracked the top ten for this time of year in four of nine previous spring seasons. Although a more modest count, the 13 Golden-crowned Kinglets is perhaps the most noteworthy of all, as in one week we banded more than in any previous spring (and in fact, more than the previous 7 spring seasons combined!). Rounding out the top ten are three of our common early spring sparrows in relatively typical numbers, a handful of chickadees, and a somewhat below-average count of Red-winged Blackbirds. Over the past five years, Canada Goose numbers have been relatively modest in week 4, with mean daily counts ranging from 51 to 159, and generally reflecting a tapering off of numbers from an earlier peak of migration. However, from 2006 to 2008, their migration peaked in week 4, and so far at least that pattern is holding this spring. Matching the banding results, Cedar Waxwings were observed in strong numbers this week, more than doubling any previous year. The American Robin flocks were also much larger than usual, although not quite at the record levels observed in 2012. Conversely, despite the relatively few Red-winged Blackbirds banded, they were present in above-average numbers this week. 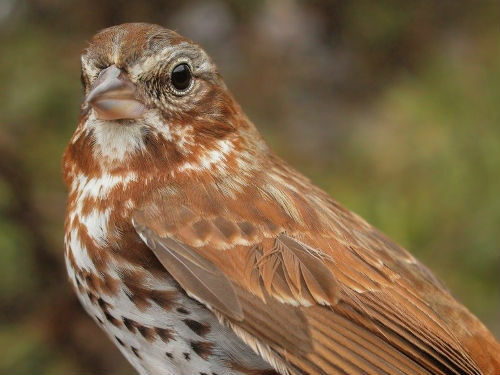 Among the rest of the top ten, Fox Sparrow was the most noteworthy, with the third highest mean daily count for this time of year, after 20 in 2013 and 14 in 2008. One of the near-record 28 Fox Sparrows banded this week. 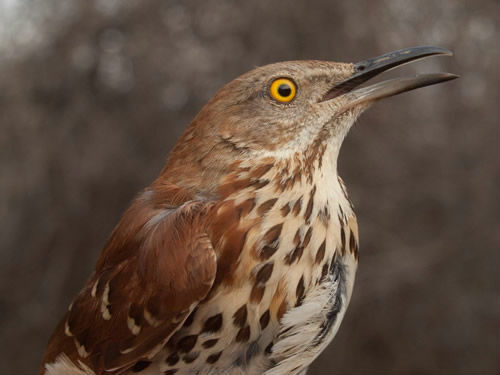 Much larger, but with some overall similarities in plumage pattern to the Fox Sparrow was this Brown Thrasher. Notes: Week 5 of spring has been the most consistently quiet of our 20 weeks of banding annually, as in nine previous years we never broke the 100 bird barrier … well, that certainly changed this week, when we shattered that mark on the first day of the week, and ended up with an impressive total of 197! To be fair, most of the week was typically quiet, with between 6 and 16 birds banded daily – the record was overwhelmingly driven by the first day of the week when we banded 145 birds, by far the most ever for a spring day. Given that the number of species observed for the week usually reflects notable contributions over several days, it’s not surprising that with only one busy day, the count of 57 was well below the normal average for this time of year. American Goldfinches are almost fully back to their yellow summer splendour. 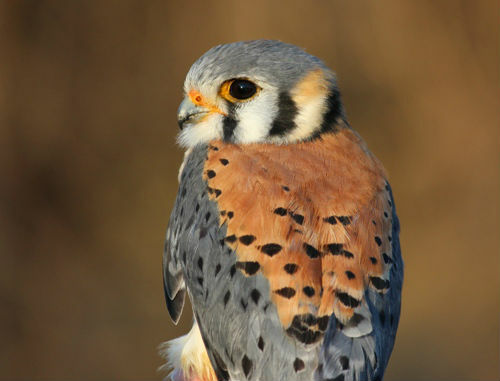 In addition to the American Kestrel, which became the 114th species banded at MBO, we banded four other species this week that were new for the season: Downy and Hairy Woodpeckers, Blue Jay, and Hermit Thrush. Only Osprey and White-crowned Sparrow were newly observed for the season. While a single species occasionally dominates the banding totals by a wide margin in winter when large flocks of finches move through, we have never seen such a lopsided list for a week of migration monitoring. 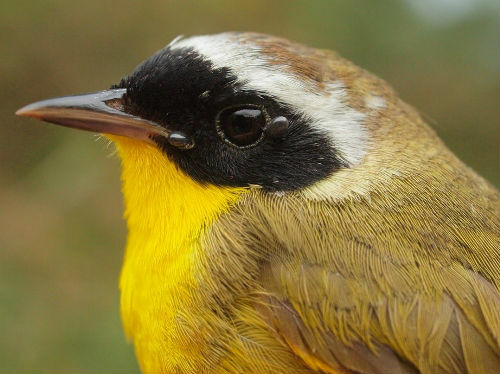 The massive influx of birds banded on April 25 was almost entirely Cedar Waxwings … they accounted for 134 (92%) of the 145 individuals banded that day! Just as impressively, over 70 of them were in nets B3 and N3 on the same mid-morning net round, and most of the rest were in the B/N nets on the following check. Also of note, most of the waxwings were second-year birds, perhaps a reflection of good productivity in summer/fall 2013 related to the excellent mountain-ash crops last year. American Robin took a very distant second place for the week, although combined with last week’s 21, the season total is already higher than for any previous full spring except 2011 (and that record of 30 is almost certain to fall soon at this rate). Rounding out the top five was a three-way tie among the dominant April sparrow species – Song, White-throated, and Fox. A couple of other sparrows (American Tree and Swamp) made it into the lower half of the top ten, along with the trailing end of the Ruby-crowned Kinglet migration, continuing surprisingly small numbers of Red-winged Blackbirds, plus Brown Creeper and American Goldfinch. Although the number of Cedar Waxwings banded dropped off significantly after the first day of the week, the count of individuals in the area remained elevated for the next five days (ranging from 110 to 200 daily, compared to a record count of 400 on April 25). Of note too, not a single waxwing banded on April 25 was recaptured as the week went on – either they learned exceptionally well to avoid the nets after their first experience, or we had at least a couple of waves of waxwings moving through, but with the subsequent ones staying farther from the nets. Canada Goose and Red-winged Blackbird are typically the top two species at this time of year, and they were pushed down to second and third place by the waxwing influx. American Robin and Ring-billed Gull vary in abundance at this point in spring from year to year, and both were more numerous than usual this week. Similarly, the count of Greater Snow Geese was unusually high, as they have only previously appeared in the top ten for week 5 twice previously, in 2009 and 2012. Rounding out this week’s list were three of the local regulars (Song Sparrow, American Crow, and Black-capped Chickadee), as well as an increasing number of migrant White-throated Sparrows. Notes: In 2006, 2011, and 2012, the pace of migration picked up noticeably in week 6 … but more frequently, it has been a relatively quiet period, as was the case this year. The 84 birds banded this week was less than half of last week’s total, but that of course was inflated by the single day deluge of Cedar Waxwings. Factoring that in, the 450 birds banded to date is still far more at this point of spring than any previous year. However, the number of species observed is far behind normal – both the 70 species observed this week and the 85 for the season to date are the lowest counts for week 6 since our first full spring in 2005, and well below the ranges of 78-88 and 97-112, respectively, that we’ve recorded annually from 2006 through 2013. 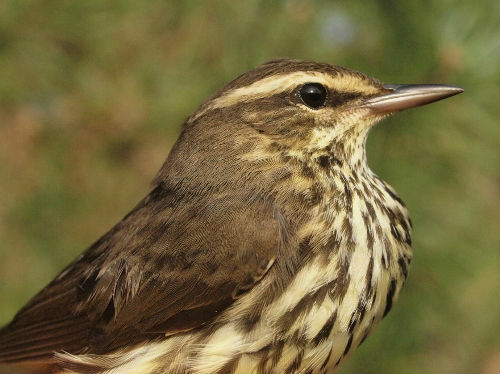 For the second year in a row, Northern Waterthrush was the first warbler species of the year to be banded at MBO – only last year that happened one week earlier. Reflecting how migration is later this spring, it was the only warbler banded this week, whereas in 2013 five warbler species were banded during week 6. Three other species were banded this week for the first time this spring: Tree Swallow, Chipping Sparrow, and Brown-headed Cowbird. Despite the near record low number of species observed this week, there were 11 newcomers for the season, including the year’s first two warblers (Northern Waterthrush and Palm Warbler), another couple of sparrows (Savannah and Lincoln’s), and a variety of others (Solitary Sandpiper, Eastern Kingbird, Warbling Vireo, Cliff Swallow, Barn Swallow, Red-breasted Nuthatch, and Gray Catbird). After a relatively slow start to the season, Red-winged Blackbird jumped up to take the top spot on the list of species banded this week, as has been the case at this point in spring for five of the previous nine years as well. 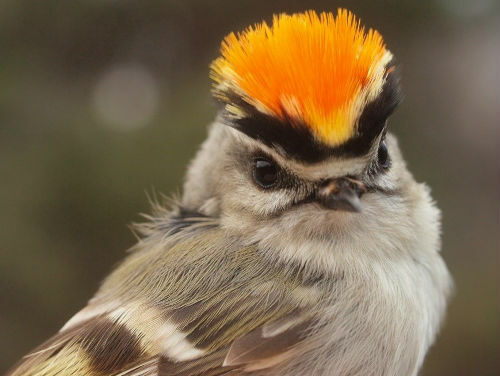 It was closely followed by White-throated Sparrow and Ruby-crowned Kinglet, both of which are almost always also in the top three in week 6 – so in that sense the results were quite typical. On the other hand, we have to go back to 2005 for a higher count of Cedar Waxwings banded in week 6, and the half-dozen American Robins banded this week was above normal as well, and has generated a new record high for spring with four weeks yet to go. Beyond that, numbers were small, with eight species tied for tenth place, and three sparrows just barely more numerous with two or three individuals each. Among the species observed, it was no surprise to see Canada Goose way out in front, as in every previous year but 2006 (when numbers were similar, but it was bumped to second place by even larger flocks of Greater Snow Geese). For the sixth year in a row, Red-winged Blackbird followed in second place, and numbers were fairly typical for this point in spring. Just behind by a fraction was Cedar Waxwing, with last week’s large flocks tapering off somewhat, but still far more abundant than usual. Ring-billed Gull numbers were similar to last week, while Song Sparrows increased a bit this week, and matched the mean daily high recorded for this week, back in 2005. Black-capped Chickadees and White-throated Sparrows both increased marginally from last week, while new additions at the bottom of the top ten were Tree Swallow and Ruby-crowned Kinglet. Notes: After a couple of rather slow weeks of migration, the dam burst this week, producing one of the busiest periods McGill Bird Observatory has had in ten years of spring migration monitoring! The 305 birds banded this week is a new record for the season, narrowly eclipsing the previous high of 299 in week 8 of 2009. The 43 species banded this week was a near record, while the 99 species observed was a new high count for week 7, and a most welcome contrast to last week’s below-normal diversity … a sign of just how quickly things can change, especially in spring. As a result, the season total of 125 species to date is now also well above average. Of the 43 species banded this week, a whopping 27 of them were new for this spring. Over half of these (14) were warblers: Tennessee, Orange-crowned, Nashville, Yellow, Chestnut-sided, Magnolia, Black-throated Blue, Yellow-rumped, Blackpoll, Black-and-white, Wilson’s, Common Yellowthroat, American Redstart, and Ovenbird. The first two vireos of the year (Warbling and Red-eyed) were also on that list, as well as Solitary Sandpiper (only our third ever banded at MBO), Least Flycatcher, Eastern Kingbird, House Wren, Swainson’s Thrush, Gray Catbird, Lincoln’s Sparrow, White-crowned Sparrow, Northern Cardinal, Baltimore Oriole, and Purple Finch. The list of species observed for the first time this spring over the course of week 7 is even longer – a jump of 40 species! Among those were all the warblers listed above, plus an additional 7: Northern Parula, Cape May, Black-throated Green, Blackburnian, Bay-breasted, Mourning, and Canada. 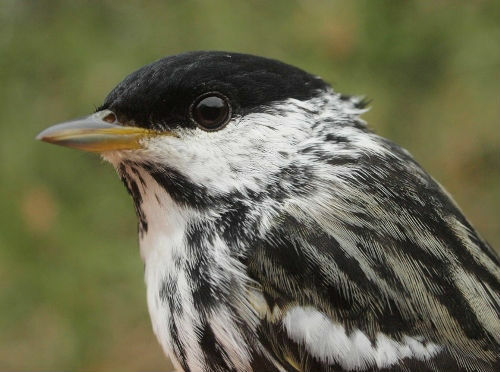 While spring migration is more concentrated than in fall, we have never before had the arrival of warblers occur in such a narrow band of time. The other new arrivals were five waterbirds (American Bittern, Green Heron, Virginia Rail, Spotted Sandpiper, Greater Yellowlegs), three flycatchers (Alder, Least, Great Crested), two vireos (Philadelphia, Red-eyed), four thrushes (Eastern Bluebird, Veery, Swainson’s Thrush, Wood Thrush), and four other assorted songbirds (Rose-breasted Grosbeak, Indigo Bunting, Bobolink, and Baltimore Oriole). Except for May 12, there were at least three new species daily, making it exciting to turn up every morning – but nothing matched May 10, when 16 new species for the season were observed. For six of the past eight years, Red-winged Blackbird has been the top species banded in week 7, but this year it dropped to fifth place, with the total of 17 also well below average. Instead, Yellow-rumped Warbler took first place, as in 2010 and 2012; the count of 45 this week was slightly above the previous high of 41 two years ago. Reflecting the mass arrival of warblers this week, another four species were among the top ten species banded – the third year in a row that there have been at least five warblers on the list for week 7, whereas in all previous years the high had been four. 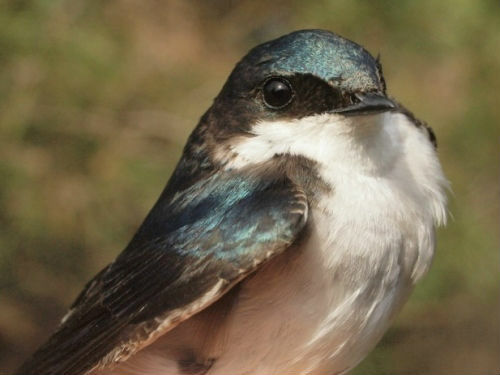 Is this evidence of the spring migration of Neotropical species advancing over time? 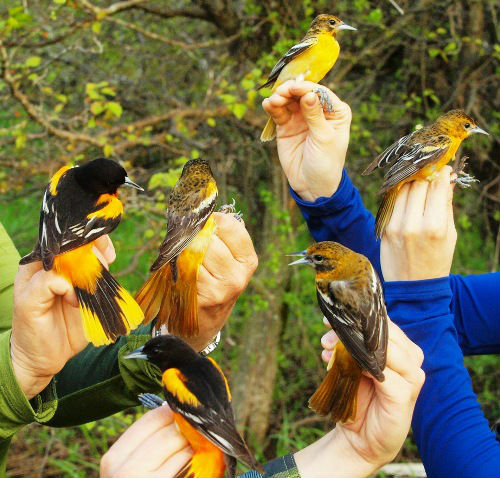 Similarly, Baltimore Oriole numbers have never before been so strong this early in spring – and in fact, the 11 individuals banded this week were more than the totals for any of the past three spring seasons. 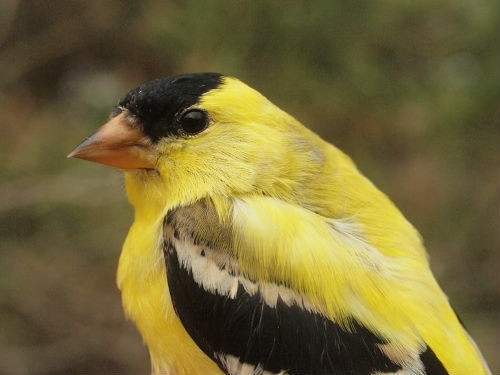 From 2005 through 2010, American Goldfinch was a fixture in week 7, always among the top six species banded – yet in the three years that followed, it never even cracked the top ten. This year that trend reversed itself with a vengeance, the 26 individuals banded being the highest ever count at this time of year. 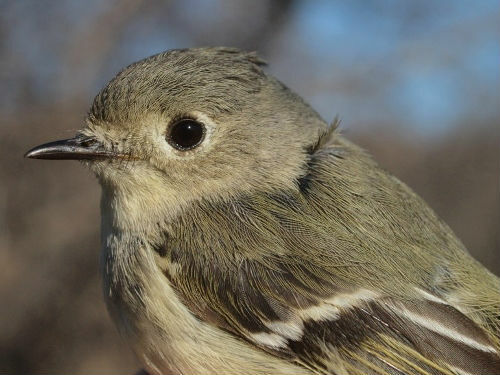 Usually Ruby-crowned Kinglets are well past their peak by week 7, with a mean total of 7 individuals banded; the 24 this week was a new record high for the period, slightly more than in 2008 (yet another parallel with the migration patterns from that spring). 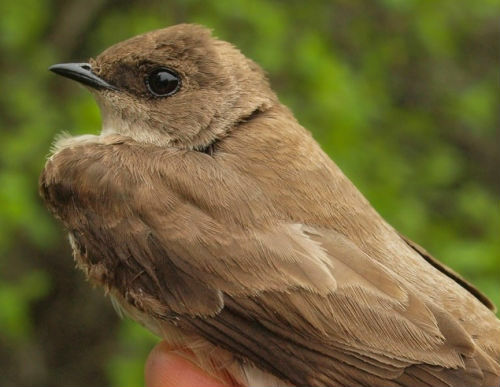 Last but not Least (pun intended), the 14 Least Flycatchers banded this week was a remarkable count for two reasons. Not only did we eclipse all previous spring season totals in a single week, but they were also early arrivals, regularly peaking in week 8 otherwise. With regard to observations, Canada Goose clung to top spot for another week, matching its position for week 7 for four of the previous years. The only exception was last year, when this week’s runner-up, Ring-billed Gull, jumped out in front. Red-winged Blackbird is the only species that has been in the top three for week 7 in all ten years of our Spring Migration Monitoring Program. A fair distance behind in fourth place was the strong initial push of Yellow-rumped Warblers; as usual, Yellow was the only other warbler common enough to register in the top ten of species observed. Cedar Waxwing numbers continue to drop from week to week, but remained enough to round out the top five – and this marks only the third time in ten years that they have been common enough in week 7 to make the list. The increase in American Goldfinches that we saw on the banding list was reflected to some extent in observations as well, while Song Sparrows and Black-capped Chickadees more or less maintained their numbers from last week. Notes: Although the number of birds banded this week tapered off considerably from last week, it was still considerably above average for this time of year, and the season total is already approaching 1000 – noteworthy as the highest previous sum for an entire spring season is 994, a record that is sure to fall next week. The number of species banded is also on record pace – in fact, only three times previously have we banded more than 65 species in an entire spring season, and we may well yet add to this total over the final two weeks ahead. Even more impressively, the 107 species observed this week is a new weekly record for MBO in any season. 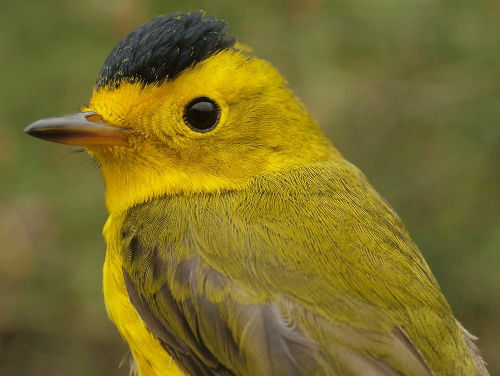 The nine species banded for the first time this week include five of the warblers that we missed last week although they had arrived on site (Mourning, Cape May, Bay-breasted, Black-throated Green, and Canada). 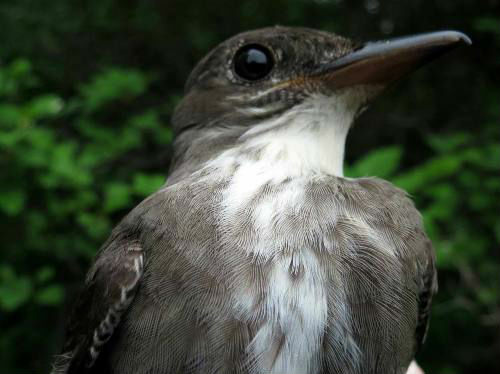 In addition, we banded our third ever Northern Rough-winged Swallow (and first since 2007), plus our first Traill’s Flycatcher, Veery, and Wood Thrush of 2014. The increase in new species observed for the season slowed somewhat after last week’s record influx, but we still added another ten. A trio of uncommon ducks for MBO (American Wigeon, Gadwall, and Greater Scaup) were among this week’s arrivals, as were two flycatchers (Willow and Yellow-bellied), two swallows (Northern Rough-winged and Purple Martin), plus Sora and Chimney Swift. Rounding out the list of newcomers was another species we observe less than annually – Clay-colored Sparrow. Warblers typically dominate the list of species banded in week 8 of spring – since 2009, the top ten has included at least six warbler species each year, and in 2014 the count came in at seven. For the second year in a row (and third time overall, including 2009), the four top species were all warblers. In a rare (perhaps even unprecedented) feat, the top four species this week are identical to the top four from this period last year! 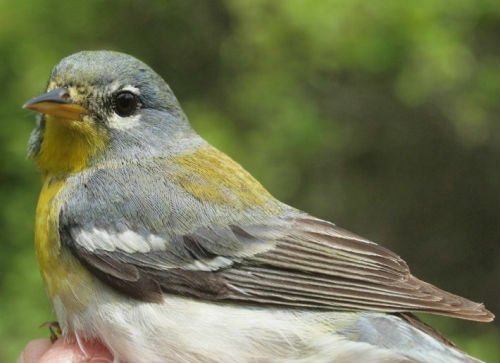 Also noteworthy, despite dominating week 8 in 2013 and 2014, Magnolia Warbler had never previously been in top place at this point in spring, and in fact from 2005 through 2009, the count of Magnolia Warblers banded during this period never exceeded 10. The number of Tennessee Warblers was actually down a bit from 2012 (42) and 2013 (38), but still above the long-term average of 18. Yellow Warbler and Northern Waterthrush numbers were also higher than average. Rounding out the top five, American Goldfinch numbers dropped a bit from week 7, but the season total is still on pace to be the best for spring since 2005. 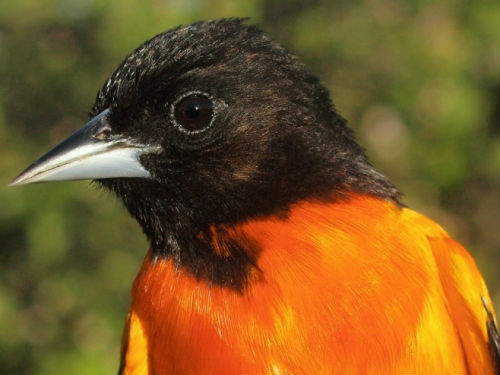 Of note among the remaining species in the top ten, the six Baltimore Orioles in combination with last week’s 11 brings the season total to the highest for spring since 2007. After last week getting close to top spot among birds observed, Ring-billed Gull finally obtained that ranking this week. It is relatively common for Ring-billed Gull to dominate at this point in May, having also done so in 2005, 2009, 2010, and 2013. Red-winged Blackbird was in second place this week, as in all those previous years (and in the other five years, it was the leading species for week 8). All other species this week were considerably less abundant than the top two, allowing Yellow Warbler to sneak into the top three for just the second time (the other occasion being in 2008 … it seems like every week this spring there is at least one distinct parallel with that year). For the first time ever, more than two warblers cracked the top ten in species observed for week 8. Tennessee Warbler was previously in the top ten in 2009 and 2012, but this is the first time that either Magnolia Warbler of Common Yellowthroat have been sufficiently common to appear on the list. Reflecting the good number of Baltimore Orioles banded, the mean daily count of 11 was well above the ten-year mean for this period (only the 15 per day observed in 2013 was higher). Notes: In the nine previous years of Spring Migration Monitoring Program, we never quite managed to break the threshold of 300 birds banded in a week; now we have passed that twice in the same season, with 305 in week 7, and a new record of 318 this week. 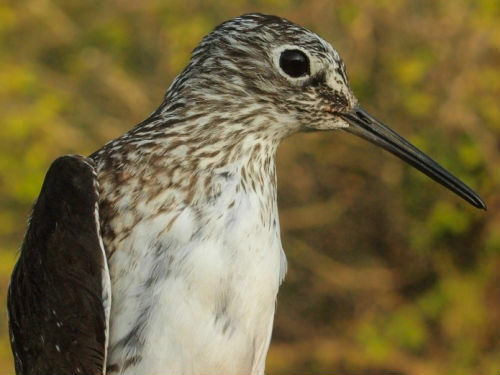 In the process, the previous spring season record of 994 has been shattered – and the 69 species banded to date has also surpassed the previous spring high of 68, set just last spring. Overshadowed by the number of birds banded are the repeats and returns, both also at record levels. Meanwhile diversity remained very high for a third consecutive week, falling just shy of 100 species observed, and with the season total of 141 also somewhat above average. By this point in the season, the number of new species is of course getting smaller by the week. 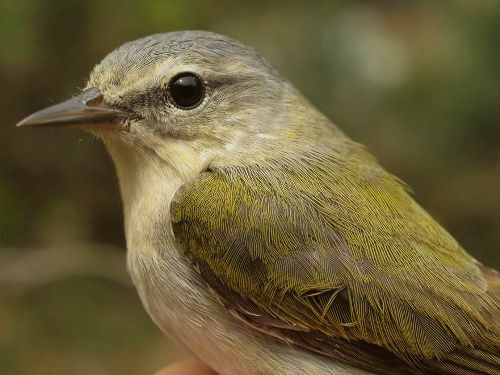 For the second time this spring we banded a species new to MBO, Olive-sided Flycatcher. Two other flycatchers were banded for the first time this spring (Yellow-bellied and Great Crested), as was Northern Parula. Meanwhile the late arrivals among species observed were the aforementioned Olive-sided Flycatcher, as well as Great Egret, Black-billed Cuckoo, Eastern Wood-Pewee, Pine Warbler, and Scarlet Tanager. This week’s record count of birds banded was fueled overwhelmingly by Tennessee Warblers, which accounted for over 30% of the total. 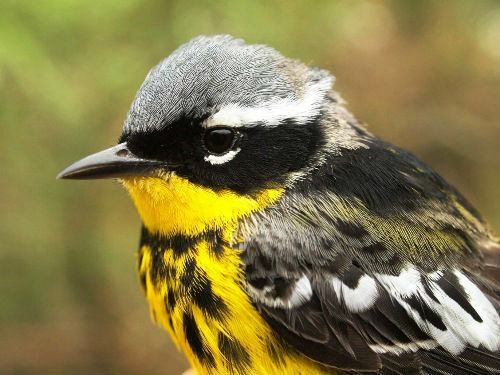 This is a record number of Tennessee Warblers for a week in any season – and more in one week than any previous entire spring! Although in distant second place, the count of Traill’s Flycatcher is similarly impressive – until now, our record high for a spring season was 19 in 2010, so to exceed that in a single week is noteworthy. Tied for third place, Wilson’s Warbler was not far off, with 24 banded this week, compared to a spring record of 28 in 2009. 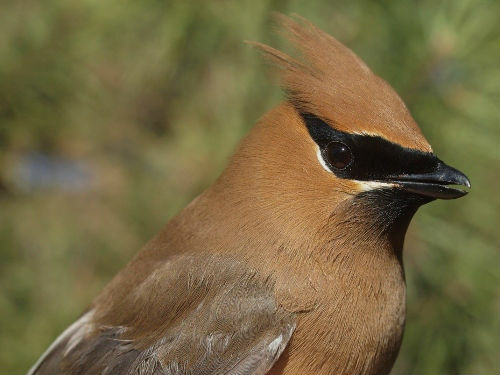 Meanwhile, the other species tied for third place, Cedar Waxwing, has become the first species ever to exceed 200 individuals banded in a single spring season. Although dropping to fifth place this week, the ongoing strong migration of Magnolia Warblers was enough to also drive it to a new spring season record total of 79 (so far). 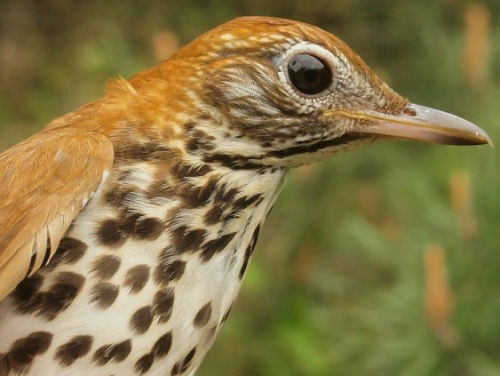 Similarly, the steady movement of Northern Waterthrushes continued for a third week in a row, and the season total to date of 46 means that the spring count has increased to a new high for a fourth consecutive year. Red-winged Blackbird and Common Yellowthroat were again banded in similar numbers to last week, while Blackpoll Warbler and Common Grackle increased and rounded out the top ten. Ring-billed Gull was the most abundant species observed in week 9 in 2005, 2006, and 2009, but averaged fewer than 10 individuals per day during this period over the past four years, so it was quite surprising to see record numbers this year (even in the three previous years when it was the top species, the mean daily count only ranged from 33 to 43). Most other years Red-winged Blackbird has been the most common bird during this period, with mean daily counts ranging from the low 30s to high 40s, so this week’s results were typical in that regard. Cedar Waxwing has now been in the top three for week 9 for four of the past five years, although prior to that is rather uncommon during this period. American Crow numbers were fairly typical, while Tennessee Warbler counts were higher than ever before in spring, parallel to the record number banded. All of the species in the bottom half of the top ten were considerably less numerous, and are local breeders, although some of the individuals observed may well have still been migrants passing through to more northern breeding locations. Another of the less common warbler species at MBO; this Canada Warbler brought the spring season total to 7 individuals, somewhat higher than the average of 4. 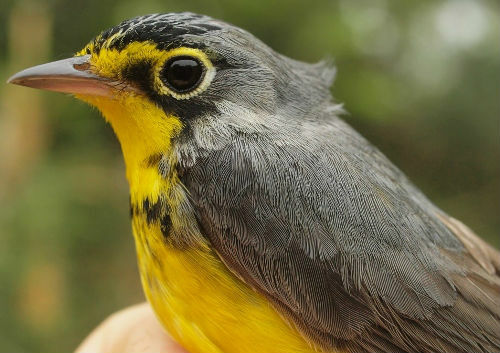 The unprecedented wave of Tennessee Warblers that moved through MBO last week was not quite finished – another 16 this week easily topped the list of species banded for the final spring period. Previously we had never banded more than 3 Tennessee Warblers in week 10, so we were again surprised to have such a large number of them right at the tail end of the season. Continuing our season-long theme, Cedar Waxwings were prominent again, wrapping up the spring with another strong second place showing, bringing the season total to 232. Common Grackles were relatively numerous for a second week in a row, and their season total of 29 ended up being the highest since 2005. With a good push of late migrants, the season total for Traill’s Flycatcher reached 34, nearly double the previous record of 19 in 2011. American Goldfinches rebounded this week to tie for fourth place, and their season total of 60 is also the best since 2005. Including a five-way tie for 8th place, five more warblers, a vireo, and a sparrow rounded out the list for the final week of spring. Among these, Northern Waterthrush (48), Common Yellowthroat (40), Magnolia Warbler (82), and Wilson’s Warbler (35) also set new spring season records – it has been a great year for warblers so far, and we are looking forward to seeing how that translates into fall numbers in just a couple of months from now. Except for 2011, Red-winged Blackbird has been the most numerous species during the final week of spring every year (in that case, Canada Goose barely snuck ahead). Over the course of those nine years, the mean daily count of blackbirds was also relatively consistent, ranging from 22 to 36. This year’s results were therefore the lowest ever, albeit by a rather small margin, and for the first time, two other species were more abundant during this period, led by Ring-billed Gull which wound up topping the final three weeks of the season. 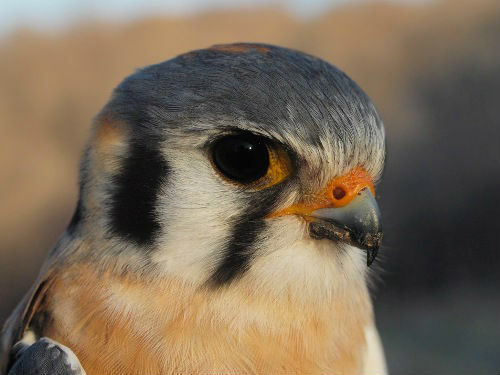 The remaining species on the list were all less than half as abundant as this week’s top three; among those, Tennessee Warbler made its first appearance for week 10, and Cliff Swallow for the first time this spring . Thank you as always to our dedicated volunteers who helped make this season a success! We look forward to seeing you all again when the Fall Migration Monitoring Program kicks off in just 8 weeks, on August 1.